August is here, and things are ramping up! We’ve got a lot of exciting things coming up here at Christ Community that you won’t want to miss. It all starts this Sunday as we gather for what will be a memorable days in the life of our Church! One of the major responsibilities every church has is the opportunity to see men called as pastors, equipped, and commissioned to fulfill God’s call to lead and shepherd in the Church. Ordination is a process of testing and confirming a pastor’s call to ministry, and it’s an important milestone for every pastor. This Sunday we have the privilege of ordaining Pastor Kyle and Pastor Jeff, two men who are examples of the type of shepherd God demands. Also, We will be licensing our two pastoral assistants, Michael Byrd and Garrett Hill. Pastoral assistants are men on our team who have indicated they believe God has called them as pastors. We invest in them, give them opportunities to learn and serve, and we take time to teach and train until we can effectively confirm their call to be a pastor. Both Michael and Garrett are vital to the ministry of Christ Community and we are grateful God has brought them to our church. I hope you will be with us for this special moment as we affirm these critical ministry team members. What a privilege! For months, we’ve been praying for the launch of Vintage Church Pittsburgh. This Sunday, we’ll be commissioning our Pittsburgh Launch Team. Join us as we send off Pastor Kyle, his family, and the rest of the team. Our lead church planter, Pastor Rob Wilton, will be with us to celebrate this great day! We’ll have celebrate the birth of a new church with cake after the service, so make sure you’re here! Five weeks remain in our summer giving challenge and you have been so faithful to give! The way summer giving goes is a little bit of tug and war. We get ahead and then we fall behind because of all of the summer travel. We are currently $10,350 behind of where we should be. Historically, August has been one of the lowest giving months of the year for our Church. It could be because of school starting and some trying to squeeze in one last family vacation before the Fall. Regardless of why, it’s a low giving month. I share this with you so that you will know my heart is to see us blow the roof off our generosity throughout August! COMMIT – Commit to being a responsible steward of God’s resources, whether you are with us on Sunday or on vacation. PRAY – Pray for our weekly budget! Pray for God to provide every penny we need to meet our annual budget of $1,445,609 through the generous obedience of his people. GIVE – The goal is faithfulness! If you are not a regular giver to our ministry, consider stepping out in obedience, trusting God, and make a commit to become one! God will bless you because you are obeying him when you give. If you’ve missed some Sundays and have fallen behind, you can make it up this Sunday or give now by following this link. I believe we will meet our summer goal of $437,400 by September 2. It’s going to take all of us being faithful! Let’s defy history and be incredibly generous this August! 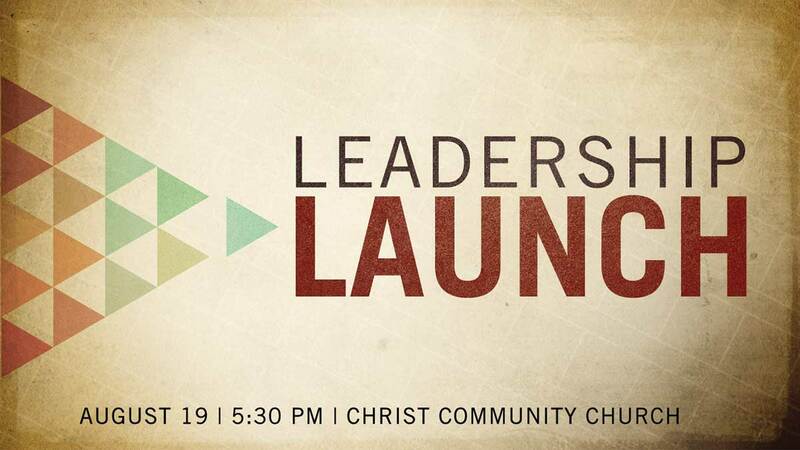 Finally, mark your calendars for Leadership Launch at 5:30 p.m. on August 19. If you’re a volunteer or leader in any ministry at Christ Community, or if you’re thinking about jumping into serving, you will not want to miss this! We’ll set vision and equip you for the upcoming ministry year. Dinner and childcare will be provided. Register here. I’m excited to dive into the Fall together, but we still have a few more weeks of summer. Let’s enjoy our summer days and pray for our Church daily. I look forward to worshipping our Savior and Lord Jesus Christ together this Sunday!